Reading Smith Journal this morning I come across an article about Bruce Williams Zaccagnino. Standing on water in a ravine, leaning on a cliffside, his hand perched on a train track — Bruce looks as though he has been superimposed onto a faux-natural world. Bruce is a professional hobbyist. For the last 40 years, he’s been obsessively building model train tracks. His obsession has extended beyond his basement and has forced him to build 4 more to accommodate his sprawling train tracks and landscapes. I attended and, funnily enough, participated in the Sydney Knife Show last weekend. 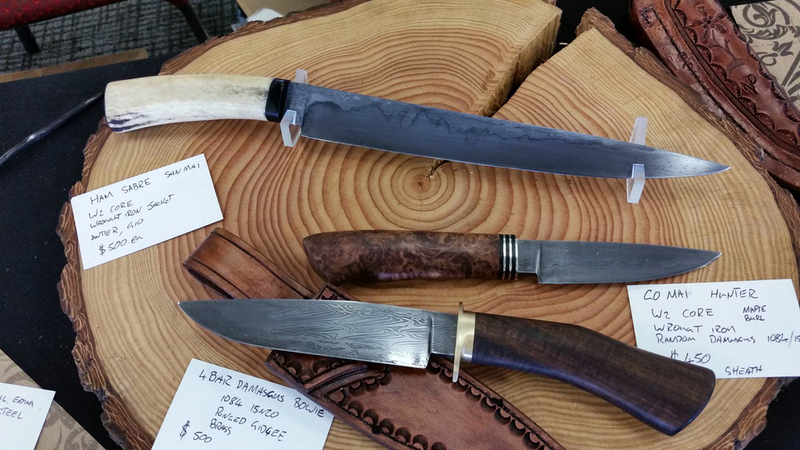 A one hour drive into the heart of Sydney’s western suburbs, the show held over 80 stalls of knives. Knives for hunting, knives that fold, knives with elaborate timber sheathes that look like they came out of the Qin dynasty, swords for challenging your foe to a duel, an actual duel, knives with bone handles and leather sheathes inscribed with portraits of the generals from the Battle of Kursk. You get the picture, there were lots of knives. Bruce reminds me of these passionate craftspeople, these guys and girls have relentlessly pursued the refinement of their skills to the point of madness. To a newbie like me, I’d only heard about this sub-culture recently. My dad had an interest in knives but I passed it off as another one of his strange obsessions (aquariums and propagating rare plants being other notable examples). Walking around and seeing the proud displays of meticulously crafted artefacts warmed my heart. Burly men with wrists as wide as salami and rough hands (and occasionally demeanours) had spent untold hours crafting intricate and beautiful objects with such love and affection. Maybe I’m not looking hard enough, but it’s rare to find people so dedicated to producing objects with such commitment, and conversely a market of people who are willing to pay for it, with punters forking out anything between $300–$4,000 for a handcrafted knife. I would say a lot of the people at the show would view one of those knives as a piece of art. I heard some guys say they were never even going to use the things–the knives were to own to give to their son when he turns 18, or to fend off their daughters suitors when she’s 16 (not sure how I felt about that one). From what I could see, most of the punters weren’t the types to stand in-front of a Rothko and think it was speaking to them. For them, a beautiful knife spoke to them in another way. A knife has a purpose: it’s a simple and ubiquitous culinary tool; and there’s an element of danger to them–I didn’t see any spoons on display. A knife represents values that these guys and girls aspire to: hard work, dedication, skill and courage. Knife-making is a solitary activity, these guys would all have workshops in their backyards and be spending tens of thousands of hours improving and perfecting their technique, some knives can involve up to 100 hours of work. Bruce’s obsession has seen his enthusiasm for miniature train world’s escalate into 40,000 feet of track and paper blueprints for the landscapes stacking 4 feet high. To an outsider like me this is madness. But for the impassioned maker, this is living. Making is fun, but the real kicker for these makers is the imagination and meticulous planning that kicks off the process which is the fun part. From some of the conversations I had, I could tell these guys view knife shows as their coming out moment–a time in their knife-making careers when they reach a point where they’re satisfied enough with their skills to be able to put them on display. Being an outsider, I will also say that I could see a healthy amount of competition and one-upmanship between the knife-makers, but you could say it results in the advancement of the craft, and possibly some very OTT creations that wouldn’t look out of place in a Crocodile Dundee film. Walking around and viewing the knives I felt like I was looking into these guys’ souls. You could almost see what type of a woman or man they are by the design decisions they had made during the production of the knife; which is the attractive thing about buying something handmade–you’re buying a little bit of the maker. For someone like me who sits in front of a computer all day and who uses Instagram for ‘inspiration’ and who doesn’t really make anything tangible, I stood in awe of this community of people who support and challenge each other. It would be great if people started dedicating themselves to the pursuit of manufacturing beautiful things, I doubt the cost of the knives remotely cover the time and thought that goes into them, but I do think it makes for a more satisfying and contented life. Images courtesy of Liam Phillips. Apologies for not being able to credit the makers of the knives pictured. Thanks for joining us you handsome devil.